Just when you think you’ve seen it all in sports, along come the current Philadelphia Flyers. Battered and limping, they’ve skated their way into the hearts of the Philadelphia sports faithful. Many fans who think a Zamboni is an Italian sandwich are on board, wearing orange clothing and big smiles. Imagine, a seventh-seeded team reaching the Stanley Cup Final…it almost defies reality. But the reality is, the Flyers are facing Chicago in what should be an entertaining series. How did the Flyers advance this far, past New Jersey, Boston and Montreal? With skill, grit, depth, outstanding goaltending, injured players returning to action and shrewd coaching. As previously noted, during the homestretch of the regular season the Flyers were struggling just to qualify for the playoffs. Then, in the regular-season finale at home, they needed a shootout victory to ease into the playoffs. Did any Flyers see this captivating run happening? “I’d be lying if I said yes,” said Ian Laperriere, one of the Flyers “heart” players who forms an effective fourth line with Blair Betts and Darroll Powe. “Maybe late in the season we were playing better hockey than people said we were. “I signed here (last summer) because I knew this team was good. Around Christmas, I didn’t second guess that (decision). We turned things around pretty quick in the playoffs and now we’re in the dance. We have a 50-50 chance to win it. Said Betts: “When the playoffs start, it’s a clean slate. The way the league is, once a team gets into the playoffs they have a chance. There’s always upsets. New Jersey was a second seed, but we were 5-1 against them in the regular season, so we had a lot of confidence. Bill Clement has been around the Flyers since his days as a center on the Cup-winning teams. 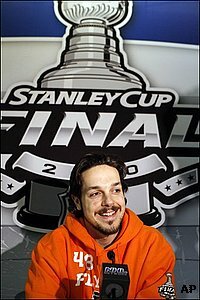 Now an insightful television analyst, Clement says the Flyers have achieved their place in the finals “with individuals doing special things and overachieving together. Then the whole process seems to get glued together and become the perfect example of synergy where the effect of the overall is much greater than the sum of the parts if taken individually. “(There is) the absolutely improbable scenario of the goaltending: Brian Boucher finding his game toward the end of the season, winning the shootout, doing well in the playoffs, then Michael Leighton just happens to be in the lineup when Boucher goes down. One major key to the Flyers playoff success has been Peter Laviolette. Hired as coach in December when John Stevens was dismissed, Laviolette has drummed the Flyers into better shape. It took a while, but Laviolette has all the Flyers playing his system. Wouldn’t it be special if the Flyers repeat what Pittsburgh did last season when Dan Bylsma replaced Michel Therrien as coach and the Penguins went on to win the Stanley Cup? “It’s been a long time since I’ve seen a coach that is able to find the right buttons to push, and then have the understanding of when to push them,” Clement said. “A perfect example is when he calls timeouts. He does that on gut instinct. The Flyers even have race-car drivers in their corner. A few years ago, Kevin Harvick, the NASCAR Sprint Cup points leader, became friends with Jeff Carter. Harvick was in Philly promoting a race at Richmond, Virginia. When he learned that Carter is a NASCAR fan, he and the Flyers forward met. Harvick then invited Carter to races at Dover, Delaware, and Bristol, Tennessee. Harvick said he and his wife DeLana have watched all the Flyers playoff games. They attended the Flyers-Montreal series opener and plan to be at Game 3 of the finals. Harvick marvels at the intensity of playoff hockey. Martin Truex, from Mayetta, in Ocean County, New Jersey, is a lifelong Philadelphia sports fan. He also attended the Flyers-Montreal opener and expects to be at Game 3 of the Final. Truex also thinks the way the Flyers have marched to the Stanley Cup Final translates to other sports. They’ll have to play great to defeat Chicago. “The Flyers will be seeing themselves, only they’ll be seeing a team with more speed,” Clement said. “They’re not as deep on the blue line as [the Flyers] big four, but Duncan Keith and Brent Seabrook are really good. They’re riding a goalie (Antti Niemi) as the Flyers are, that had never played one minute of NHL playoff hockey before this year. Flyers-Chicago should be a lively series. I’ll be surprised if it doesn’t go six games. The Blackhawks are the favorites, but all the pressure is on them. While Niemi has been outstanding thus far, we’ll see how he reacts in the Final. One advantage the Flyers could have is the Blackhawks are aware how relentless Laviolette’s team has been. Until Chicago can clinch the series, in the backs of their minds they’ll remember how the Flyers rallied against Boston. Please note that the views expressed in this column are not necessarily the views expressed by the Philadelphia Flyers Hockey Club. Bill Fleischman is a veteran Philadelphia Daily News sportswriter. He was the Flyers' beat reporter for the Daily News in the 1970s, and continued to cover games in later years. A former president of the Professional Hockey Writers and the Philadelphia Sports Writers Associations, Fleischman is co-author of "Bernie, Bernie," the autobiography of Bernie Parent. Fleischman also is co-author of "The Unauthorized NASCAR Fan Guide." Since 1982, he has been an adjunct professor in the University of Delaware journalism program. He is a graduate of Germantown High School and Gettysburg College.